Slovenia has a lot to offer: mountains, medieval villages, castles, waterfalls... it has many points of interest! 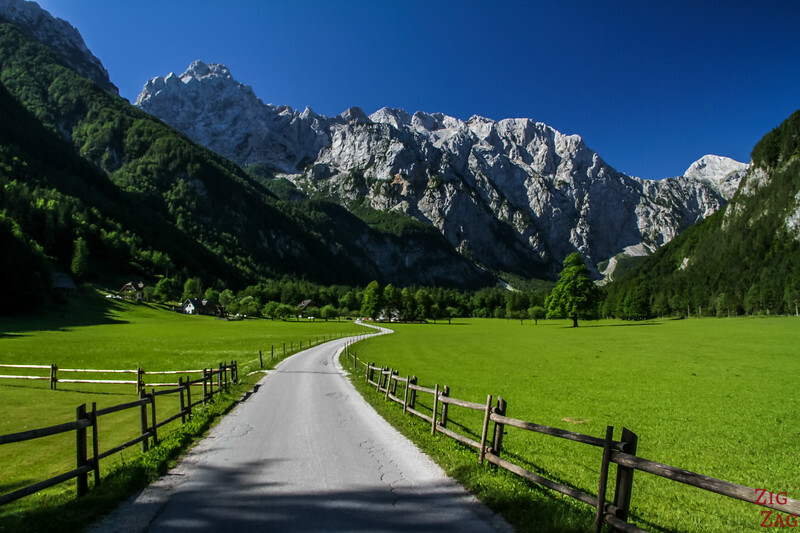 Let me help you plan your trip with the best things to do in Slovenia : all my favorite views, monuments, attractions, roads and walks with photos to help you in your selection of what to do in Slovenia. You can visit all of them with a rental car. 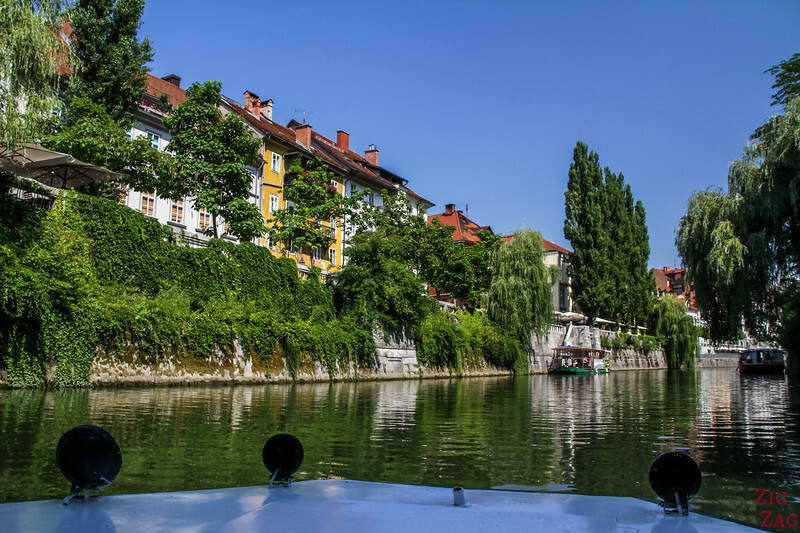 Or you can book organized day tours from Ljubljana for several of them. 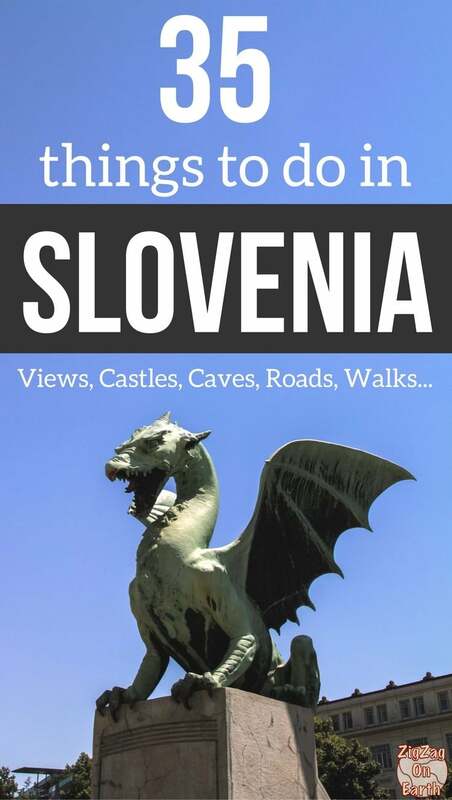 All 35 locations, along with many other beautiful places, are included in my eBook: The Road Trip Guide-Slovenia. For the other categories below, I have selected only 3 best, but for the best views in Slovenia, I just could not limit myself. So here are photos of my favorite 5 and why I really enjoyed them! 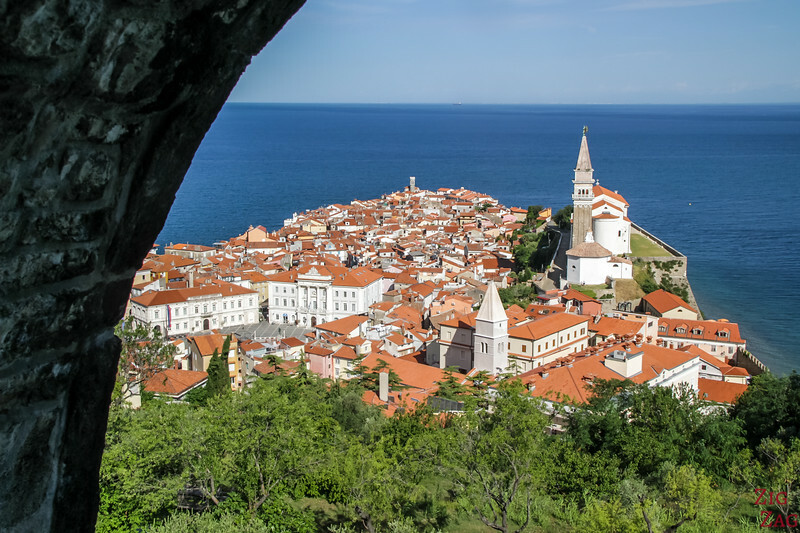 Water views, old town and fortifications, this is such a beautiful view of Piran! The fortification walls are accessed after a 10min steep climb fro the city center. 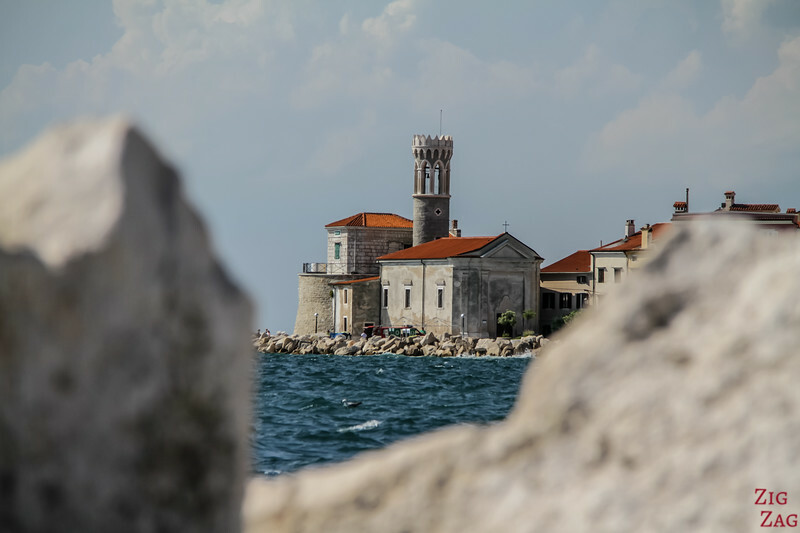 And you can get to the top of the watch towers for a splendid view of the peninsula, Tartini square, the roofs and the Bell Tower. More photos of Piran here. I was so happy to have booked a night in the Logar valley at Hotel Plesnik - This way I was able to enjoy this amazing view with different light in the evening in the morning. One of the best things to do in the Ljubljana is to get up the Skyscraper tower to enjoy a drink with the best view over Ljubljana. 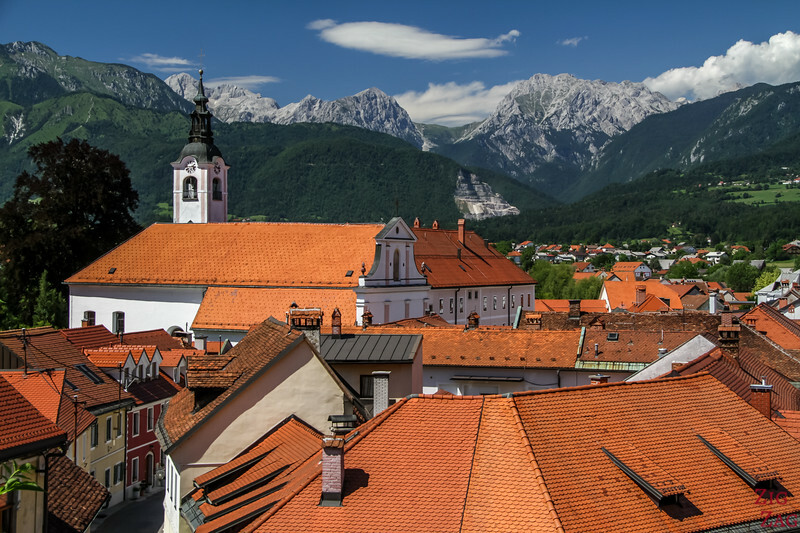 From there you can see, the roofs of the old town, the castle on top of its hill and the Julian Alps in the distance. This is a particularly great place to watch sunset! I know these lakes are not natural but the view is so amazing!!! Love the color of the water (which is like that everywhere in the region) and all the shades of green in the trees. Plus is it as easy stop on one of the best drives in the country. No reasons not to stop! No big surprise here. Lake Bled is considered as the jewel of this small country and the top Slovenia Tourist attraction. 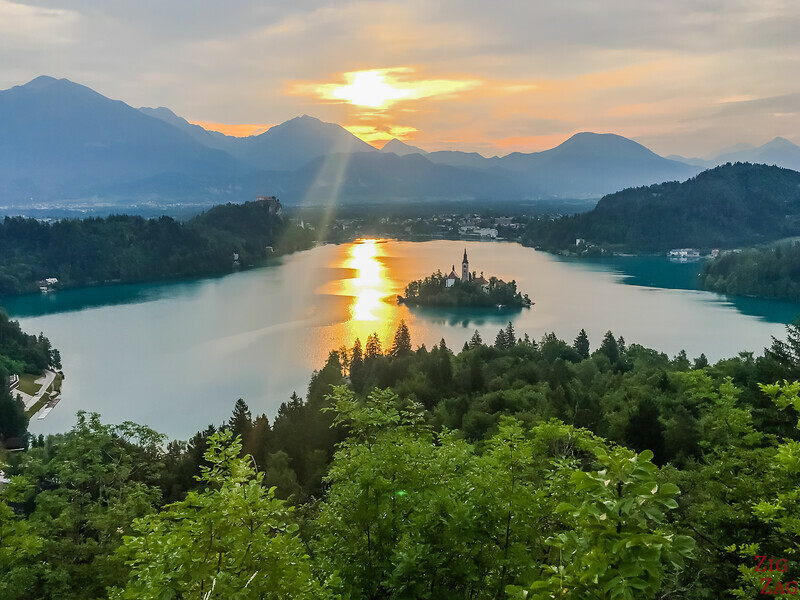 However to avoid the herds of tourists, head to the Ojstrica viewpoint early morning to admire the best view of Lake Bled. 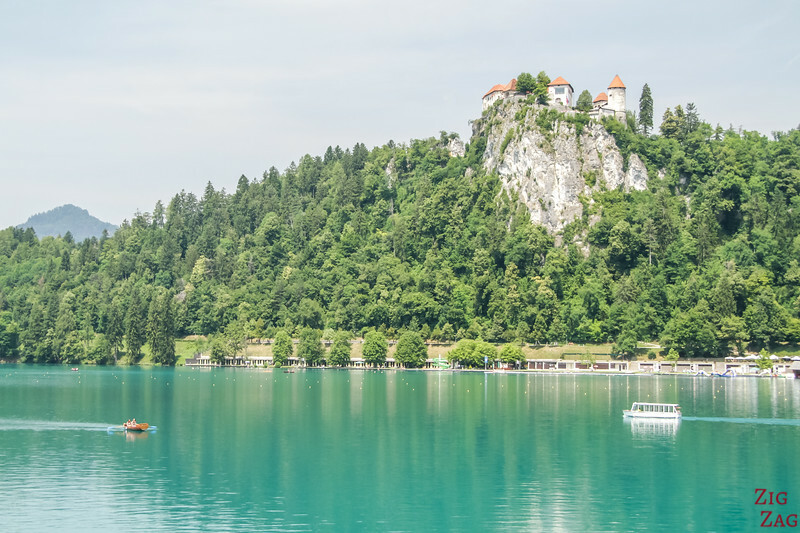 Don't want to miss it, Have a look at my complete guide of things to do in Lake Bled Slovenia. A big portion of Slovenia is covered by mountains and trees. 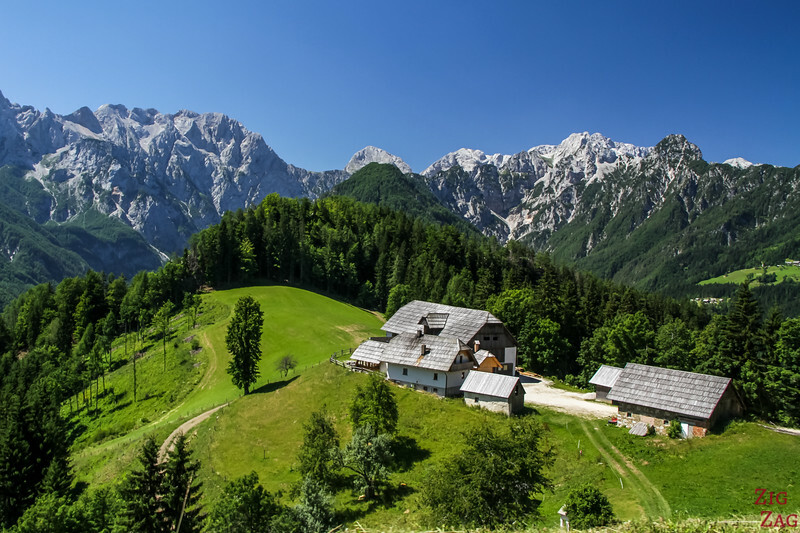 Slovenia is a paradise for hikers and nature lovers. Here is my selection of the top 3 natural wonders you should not miss during your trip to Slovenia. Vintgar Gorge was really a highlight of my trip. I visited early and had the gorge almost to myself for the first hour. It is quite an amazing place here you can walk in the narrow canyon and admire the color changes due to the variation in depth of water. 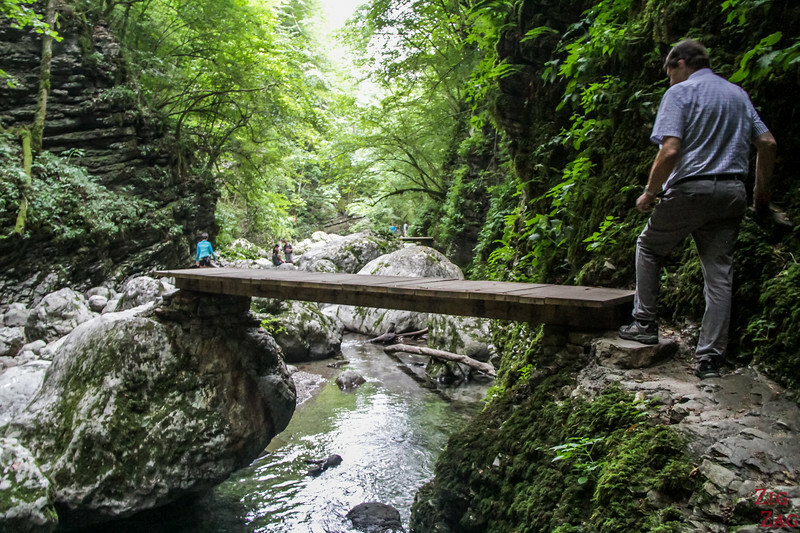 Check out a video and many photos in my article dedicated to the Vintgar Gorge. 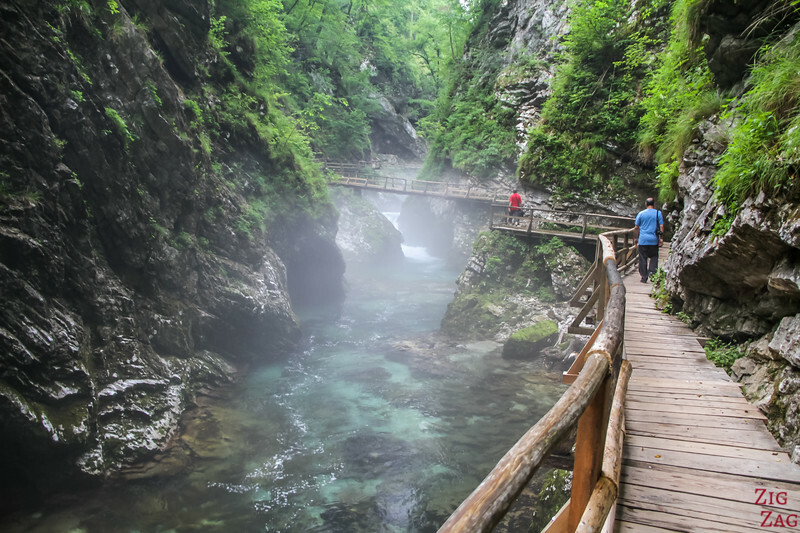 FYI - It is possible to visit the Gorge on a day trip from Ljubljana and it combines with a visit to Lake Bohinj which is my second choice below! - Check out program and book. Ask locals and they will tell you to visit Lake Bohinj rather that Lake Bled. I think both have their own interest and beauty. However if you are looking for nature and pristine landscapes then lake Bohinj should be your choice. Once again the colors are stunning and it is so peaceful! 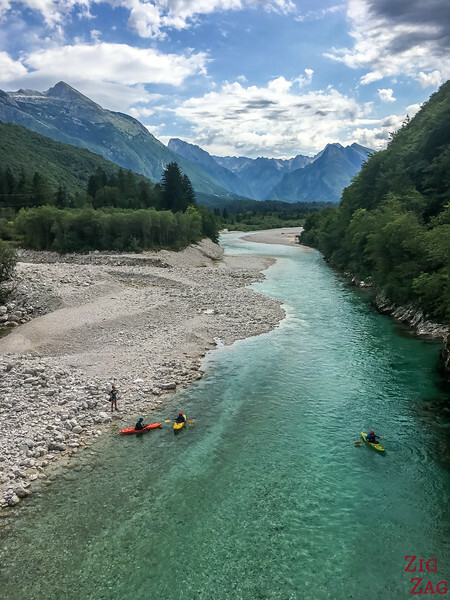 The Soca River is probably the most famous in Slovenia. It is also called the 'Emerald river' (even though almost all of them have those amazing colors). It is quite long with some quite area, and other portion where the water is rushing through a narrow canyon. With the mountains in the background, it is quite a sight! Check out my dedicated article with video and photos of the Soca River and its valley. My parents were really impressed by the train system that took us deep inside the Postojna caves (see my article). 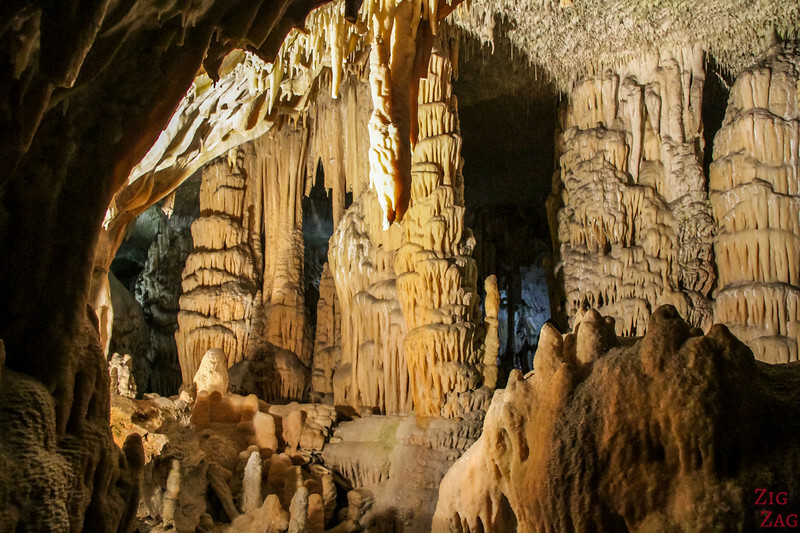 2kms inside the Earth to reach chambers with beautiful stalagmites and stalactites. Despite being very touristy, it it worth it because you forget everyone around you when you admire this wok of nature! I do suffer a little bit from Vertigo, but for views like this one, I am fighting it! Vogel is a ski center in the Julian Alps above Lake Bohinj. You can reach it via 5 min cable car ride. 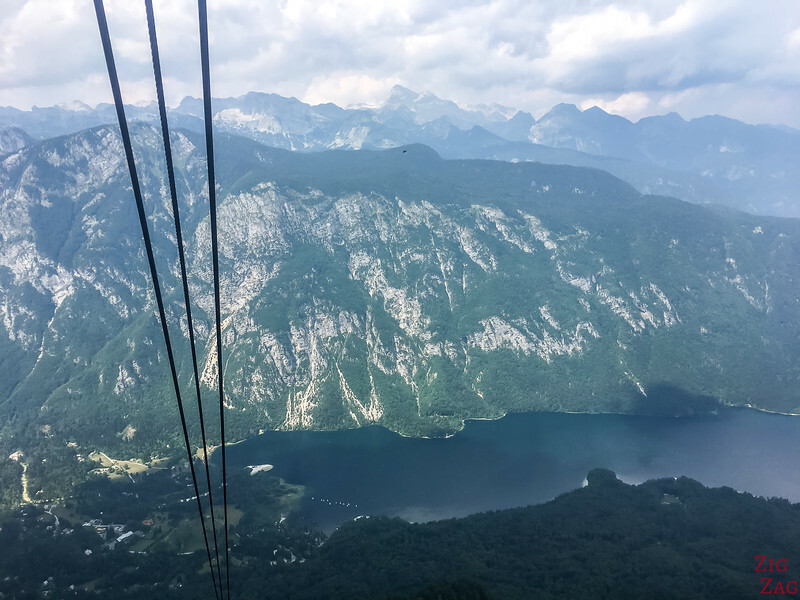 The ride is extremely steep offering unforgettable views of the lake in all its length and the Triglav summit in the background! 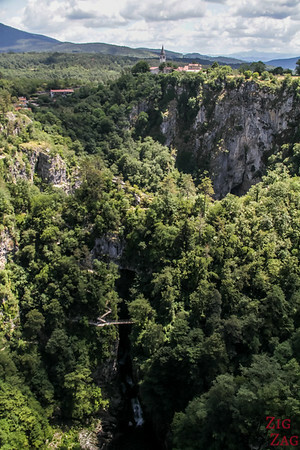 Classified in the Unesco World Heritage List, the Skocjan Caves are very different from the Postojna one. No train ride here, you have to make the effort to hike inside. However the vastness of those caves with the deep canyon and underground river are an experience you will never forget. This would probably trigger a lot of discussion in the Slovene family. Since the country is full of old city centers, it is difficult to decide on your favorite. But below are 3 that I particularly enjoyed visiting. In the middle of my trip, I took a 2 day break in Piran. I am so glad I did. This is such a unique town. I love the atmosphere, the walk by the water, the history and the amazing view from the walls (as we saw before in this article). It looks like no other city in Slovenia, with more of an Italian feel. And big bonus, cars cannot go deep into the peninsula. 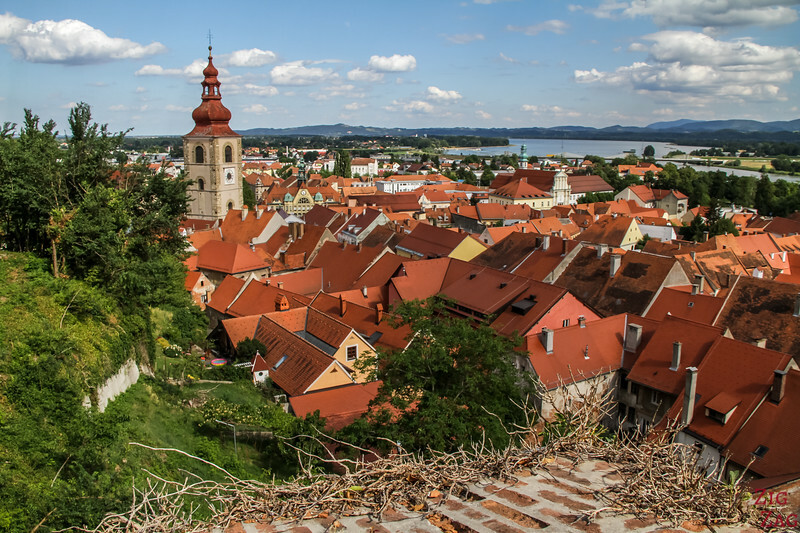 Ptuj is the oldest recorded city in Slovenia. It had a troubled history for a long time. Nowadays you can enjoy a stroll by the river, explore the streets and churches as well as climb to the castle for beautiful views of the rooftops. This town does not make it on many list of things to do in Slovenia. But I had a crush on it. It as so quiet, like standing still in time. 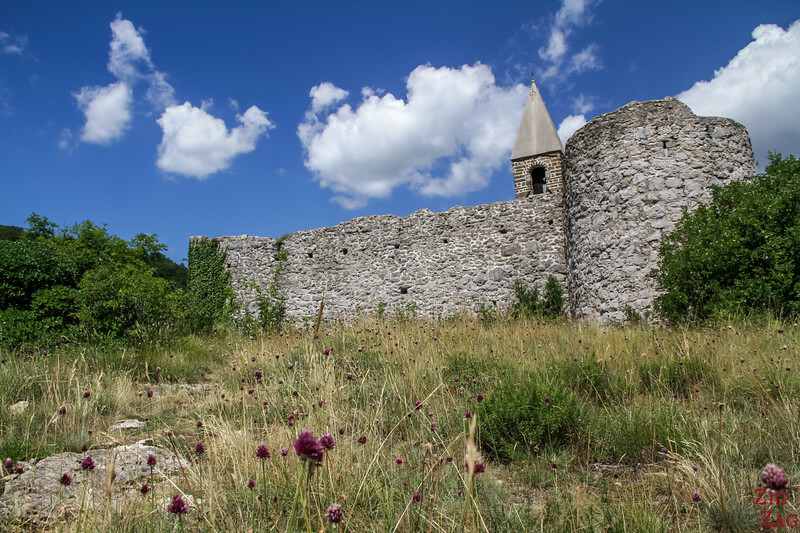 Not far from the beautiful valley of Logarska Dolina and the famous Farms of Velika Planina, the charming small town has 2 castles in ruins. From the one in the city center, you can admire the view above with the rooftops and the mountains behind. 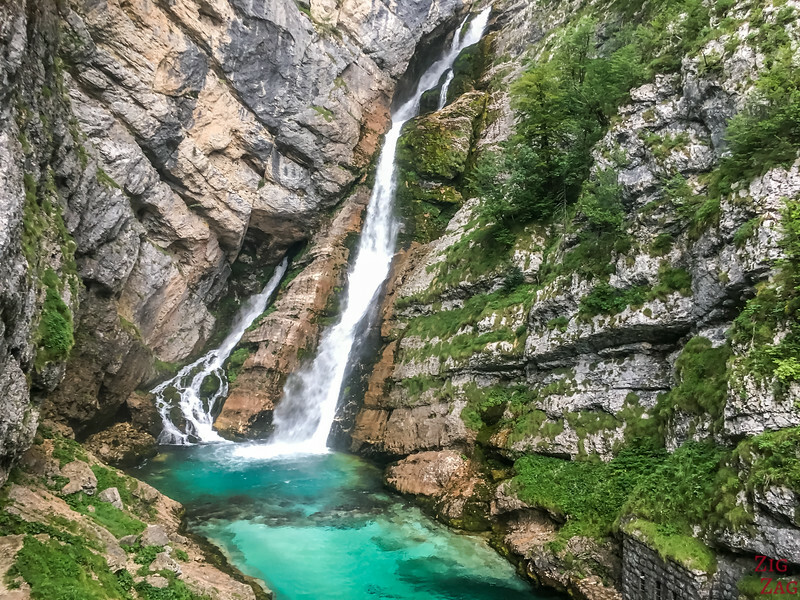 Waterfalls are considered one of the best things to see in Slovenia, because of the emerald color of all waterways there. I have to agree, that they were quite surreal. Very different from the powerful waterfalls of Iceland, here they are more delicate and colorful. 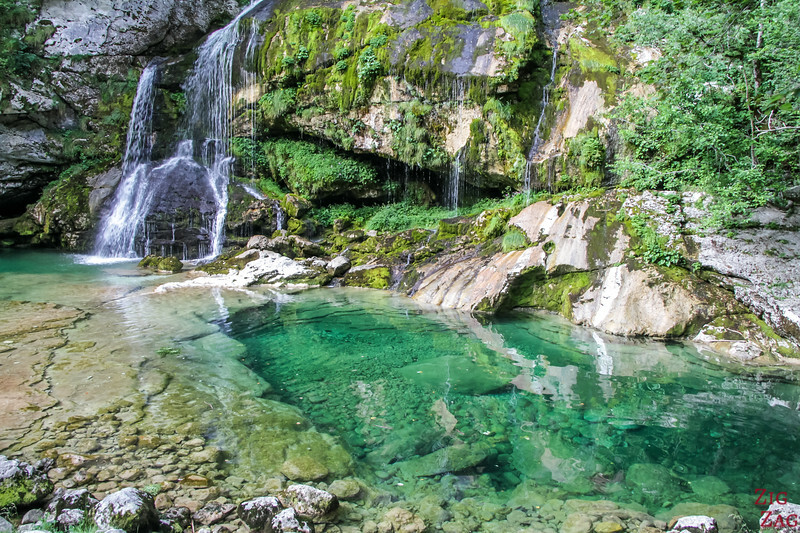 See all my favorite Slovenia waterfalls (including Virje) in my dedicated article. Once again, I would probably have to argue a lot with people; Everyone has its own favorite waterfall. Mine was Virje. It is not very famous and away from the main road. I really enjoyed how delicate the flow is, the plants and lichens on the rock wall as well as the emerald pool at the bottom. I was expecting to see fairies flying around! Another one that is off the beaten track (the last 2km of road are unpaved). I had a lot of fun at Pericnik. After a 10min steep climb you reach this amazing drop in a green valley. The best part is that you can walk behind! Just be aware that, because of the mist, you will walk back down quite wet. Have a look at a video and more photos in my article dedicated to Pericnik waterfall. 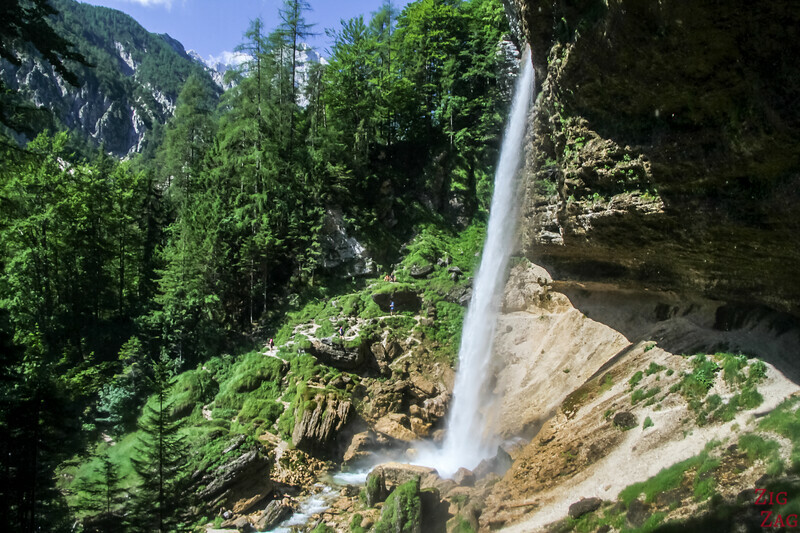 If you ask locals what the best waterfall in Slovenia is, many will answer Savica. This is kind of a classic to climb the 550 steps to reach this view. The A-shaped waterfall comes out in the middle of the cliff and falls into an sparkling emerald pool. 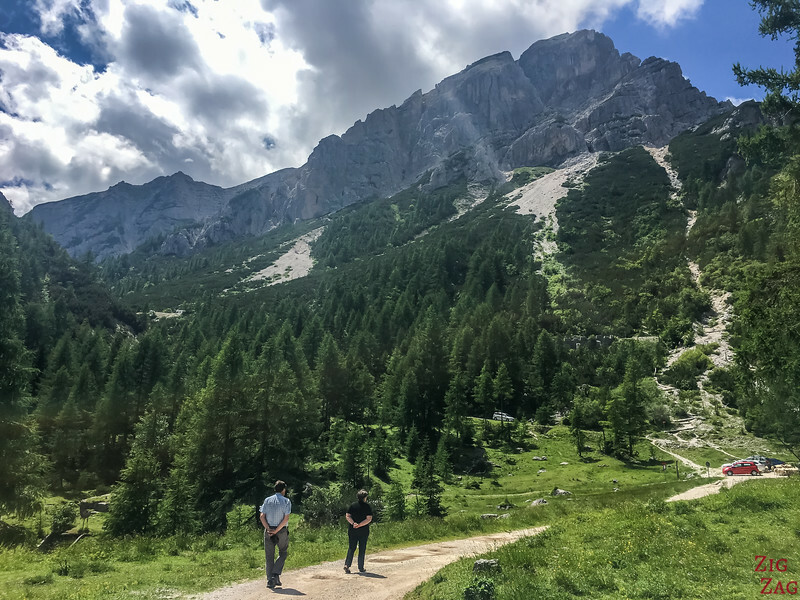 There are plenty of big hikes to enjoy in the country in the Julian Alps. But if you are not yet ready for a 10h hike or a multi-day trek, here are 3 short walks that will offer you magical scenery. And we are back to the Vintgar Gorge. I know I have already listed in before, but I really really enjoyed it. This short walk is done on wooden platforms or on trails along the river in the gorge. Many times there is a bridge to cross over the gorge and get amazing views. This is quite an easy walk. I have not selected Kozjak as one of the best waterfalls. However it is worth a visit in combination because the walk to get there is very enjoyable. It will take you along the river in open areas, or under the tree and across the stream to this waterfall hidden in a cave. It is one of the cool things to do in Slovenia. 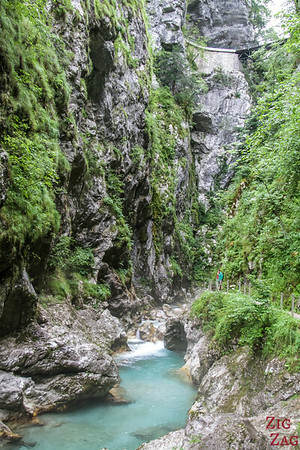 Another walk, another gorge... A bit more, South are the Tolmin gorges. It is a different experience as the Vintgar one and more strenuous. The First gorge is not as long, but very narrow with towering cliffs. And in the second gorge you can climb to see a big boulder stuck. 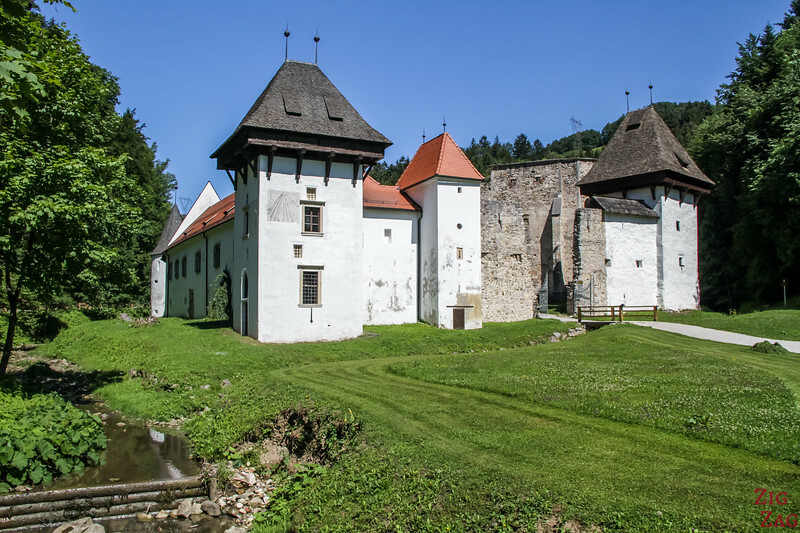 Castles are some of the most importation points of interest in Slovenia. Among the most famous are the Bled castle and the Ljubljana Castle. I created a list with some of my favorite Slovenia Castles and here are my top 3. I really enjoyed the Celje castle the most because of its location above the meet of 2 rivers and its stunning views of the surrounding mountains. In Summer, they often host medieval events. Bled castle ended up being one of my favorites. Not for the castle itself, because there was not much to see to my opinion, but the splendid views of the whole Lake Bled. I could have spend hours sitting there admiring the scenery. 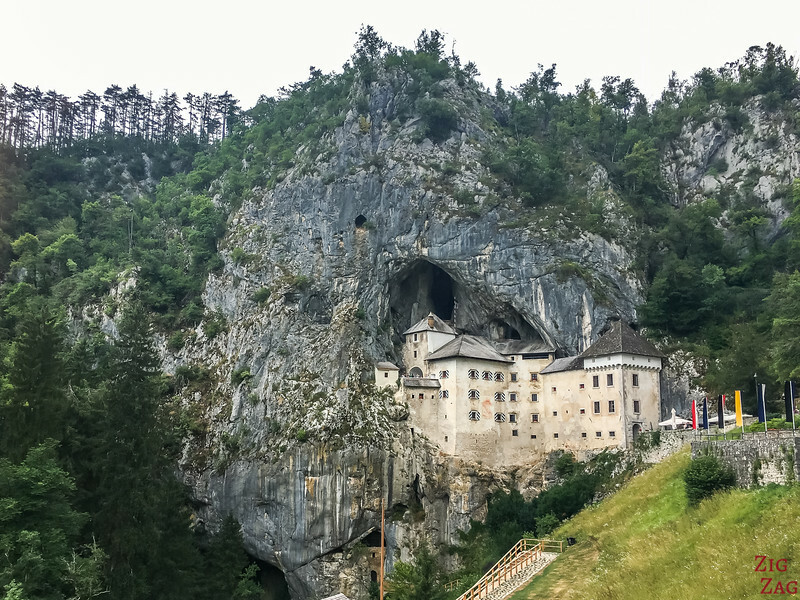 Predjama is the best preserved cave castle in the world. A visit will give you great insight in how construction happened and how harsh but safe, life was in the fort. It feels like an adventure! Visiting Slovenia on a road trip? Slovenia has a good network of motorways. But head out of the main tracks with these 3 scenic roads that I think you should not miss. 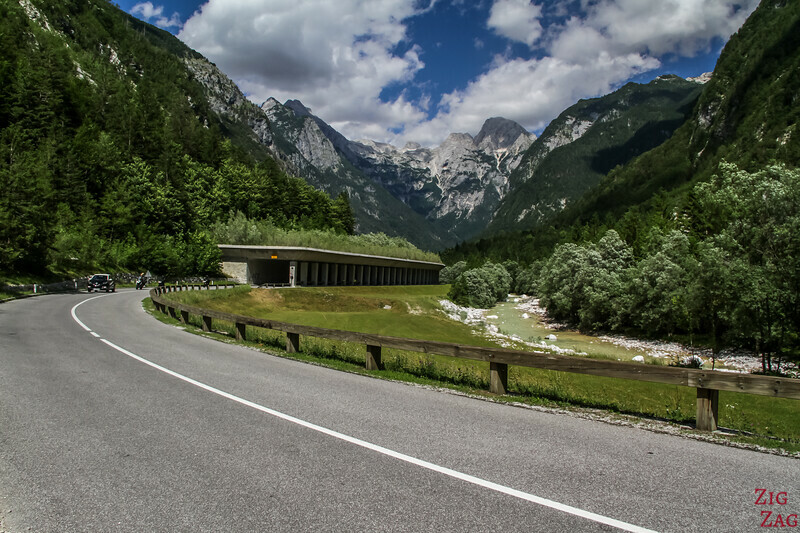 The region of Logarska Dolina (Logar Valley) is trying to develop its tourism appeal. And believe me, they have a lot to offer! They are now developing a little road in the mountains that lead to traditional farms and views of which it is difficult to capture the beauty. Don't forget to stop at the farm to taste the local produces! Vrsic is the highest pass in Slovenia. The road up and down includes 50 sharp bends and it is worth it! The Soca Valley is between Bovec and the Vrsic pass. The road allows you to drive along the Soca 'emerald' river and stop in many places to admire its beauty. The whole way you discover fantastic views of towering mountains with a colorful river. So I have been focusing mainly on nature because these, to my opinion, are the best things to see in Slovenia. 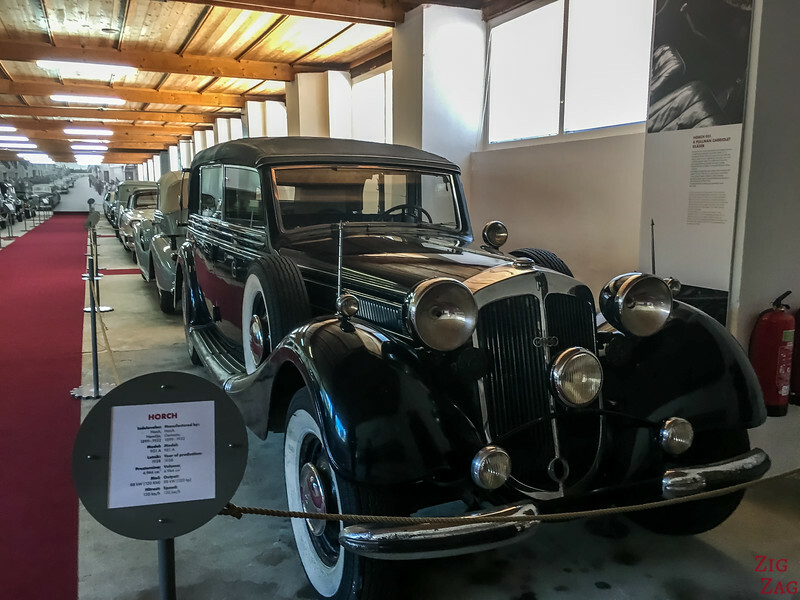 But if you want to learn more about the history of Slovenia, life in Slovenia or just want to keep busy on a rainy day, here is my selection of 3 fantastic museums. Note: in almost all the museums I did outside of Ljubljana, I was able to enjoy them almost to myself despite them being very well done. Crazy! 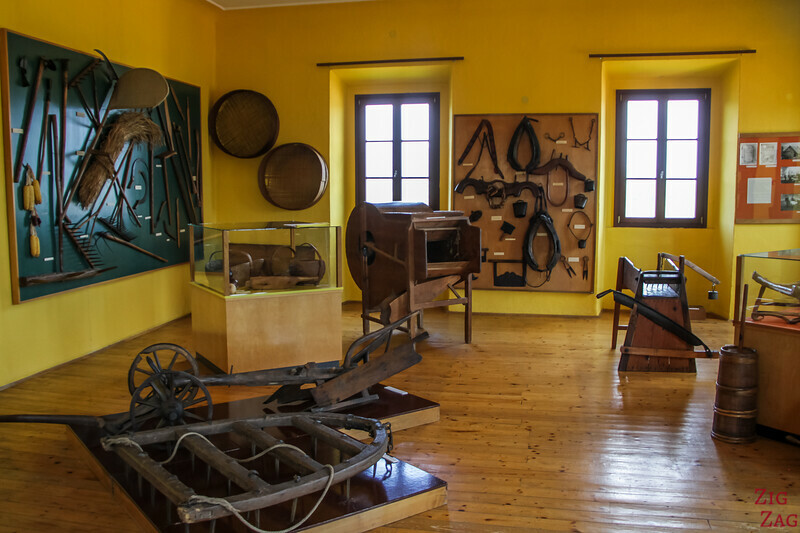 The Technical Museum of Slovenia is located only 30min away from Ljubljana in the small village of Bistra. 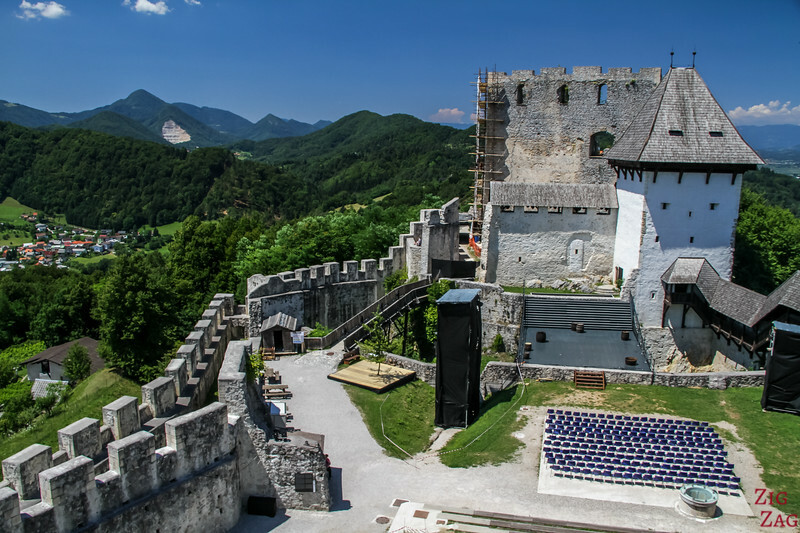 The local castle is being used to house fantastic collections: car, trucks, buses and also equipment for different types of work: printing, sewing.... as well as all you want to know about the first industry in Slovenia: forestry. And so much more! You could spend 3 days there, and you can bring kids as they have activities for them to learn along. Located in the Skofja Loka Castle, it was the first one I visited and I was completely alone! It has a wide variety of collections that allow you to learn about the history and life of the region. The Town of Idrija is another Slovenia site listed on the Unesco World Heritage list. An extensive network of mercury mines were developed here. 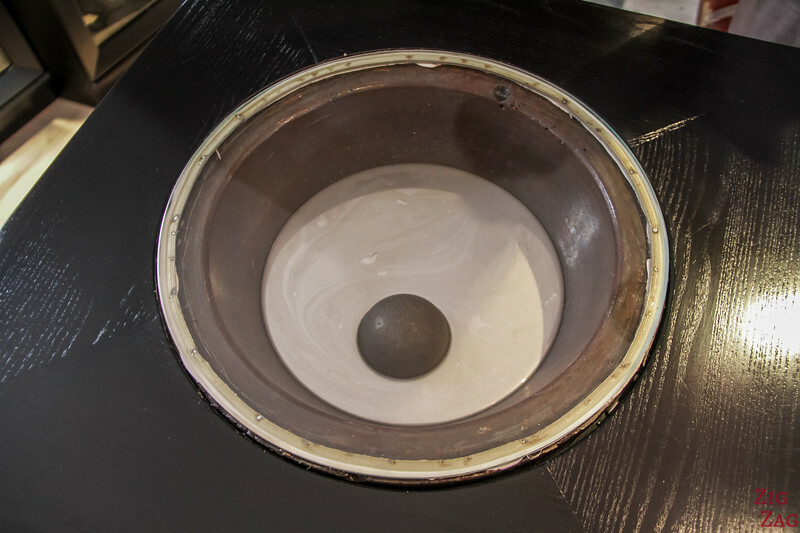 You can visit the castle to learn more about mercury, mining operation or the lace industry that developed in parallel. And you can also enter one of the old Mining tunnel to learn more about life in the mines and tools that were used. 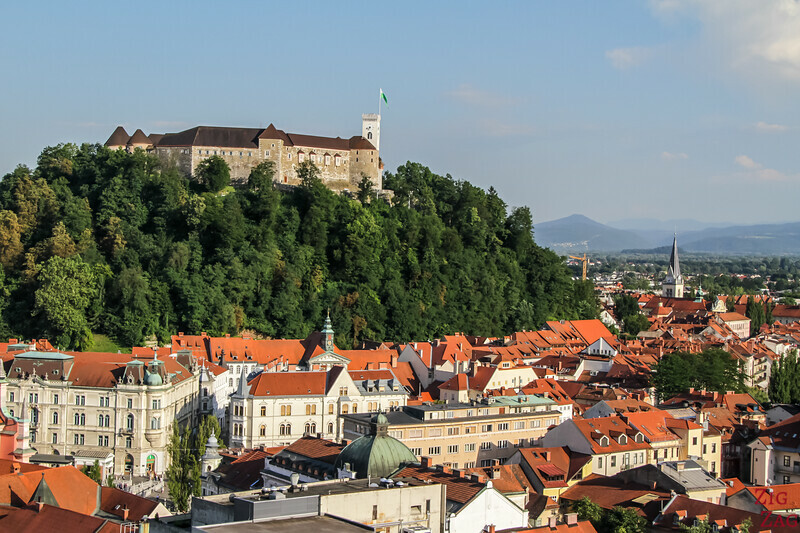 Ljubljana is the capital city of Slovenia. So far I have been focusing on nature since I am less of a City girl. But this capital city has a lot of charm. I really enjoyed that center without car and the river. There are many things to do in Ljubljana, including many museums, but I have chosen activities to just chill and appreciate the atmosphere. Several boats depart regularly for a 45min glide on the river. This is a great way to appreciate the city from another angle. It includes passing under the famous triple bridge and dragon bridge. This is a classic. 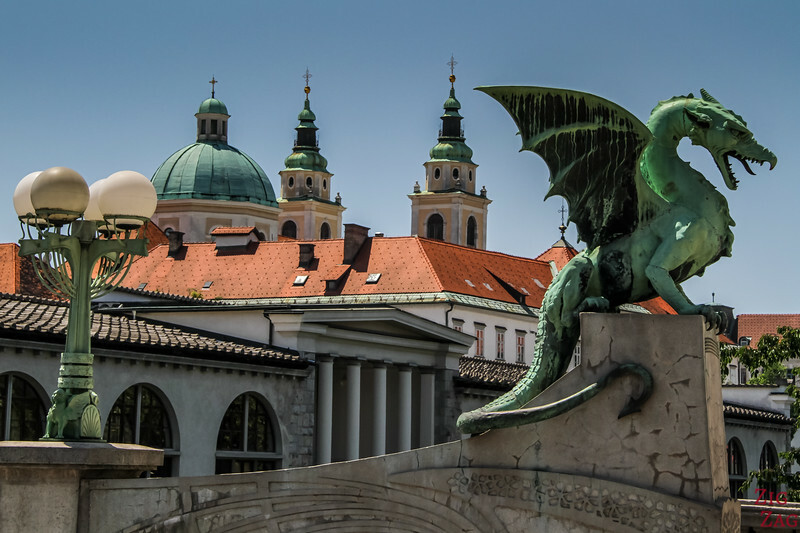 Dragons are really representative of Ljubljana. Learn more about the legend here. 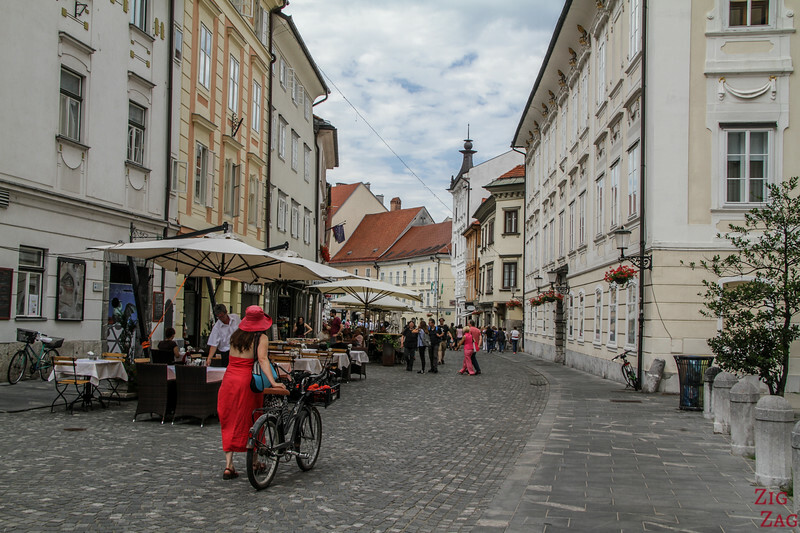 Here are 3 of the favorite places I found in Slovenia off the beaten path. Little gems. It does not look like much but this minuscule church and fortification wall is very impressive. I think it is worth a detour, North of Piran. We were astonished by the frescoes inside and the state of their preservation. Plus the surrounding landscape is very pleasant. 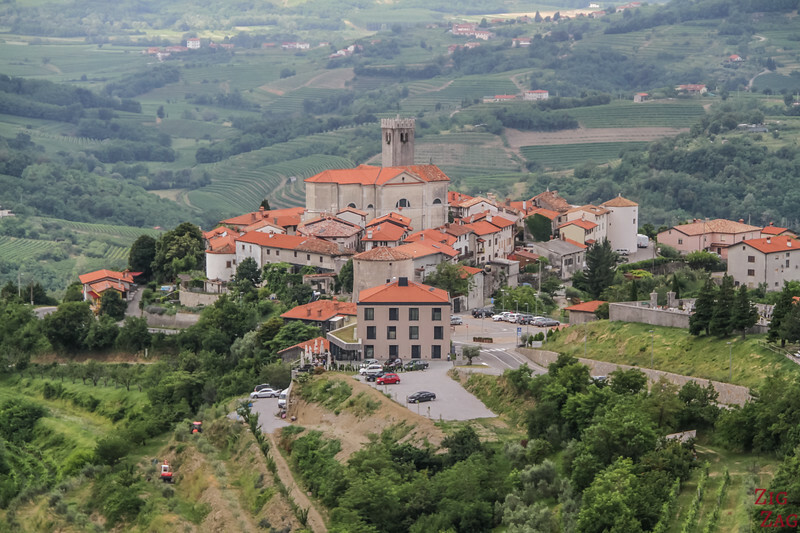 Located in the wine region of Brda, the area sees mostly local or Italian tourists (since it is close to the border). So the experience and interaction with locals are quite different. Smartno was a strategic village between Venice and Austria. Today you can tour it, visit houses or climb to the top of the nearby Gonjace Tower to get this birdeye view. As soon as I saw pictures of this place, I was drawn to it and added the detour to our itinerary. I just love the shape of the towers. And I can understand why monks used to love it. It is so silent and peaceful!!! Wow that is amazing! One thing you find common in European countries is the beautiful sightseeing, natures beauty. Lake Bohinj is what I found wonderful. Can’t wait now.